One immediately available indicator is the number of transactions processed through CHAPS, the UK’s real-time high-value payment system. The vast majority of housing transactions are settled this way, and whilst it is not possible to accurately identify which transactions are housing related, it is possible to develop a proxy. 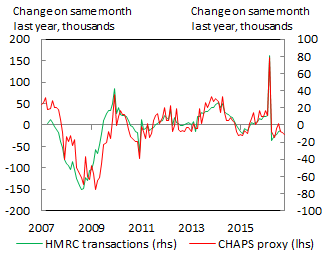 The annual change in the number of CHAPS payments between £50,000 and £500,000 closely maps official HMRC housing transactions data. Land Registry data suggest that approximately 90% of housing transactions are between these values. And restricting the series to this value range and to only the banks that process the majority of housing transactions minimises fluctuations from other CHAPS payment activity (e.g. high-value FX deals or low-value transactions). The higher number of CHAPS payments than housing transactions in part reflects multiple CHAPS payments per house sale, but also that CHAPS is used for a broader range of transactions in this value range (this could include payments generated by corporate activity, for instance for the purchase of raw materials). The relationship remains strong in periods when there are significant changes in activity such as when stamp duty on additional homes increased in April 2016, so the proxy should be a good early indicator of significant changes in housing market activity. Christopher Hackworth works in the Bank’s Monetary Assessment and Strategy division, Nicola Shadbolt works in the Bank’s Structural Economic Analysis division and David Seaward works in the Bank’s Market Services division. Next Post Macroprudential Regulation: Two birds with one stone?